The Universe is here to remind us that we are in control. To have the life you desire, all you have to do is ask. The secret to manifesting change is not focusing on the how but instead, the end result of what you're after -- the kind of life you want. Then, once you are truly focused, the Universe will conspire on your behalf. Author Mike Dooley has turned over every stone, knocked on every door, and followed every impulse. From the lessons he learned, Dooley was able to share the Universe's wisdom with the world. What started in 1998 as a little poem sent out once a week to 38 email addresses has evolved into an inspiring anecdote delivered to over 150,000 subscribers from 169 countries, each receiving a new note from the Universe five days a week. 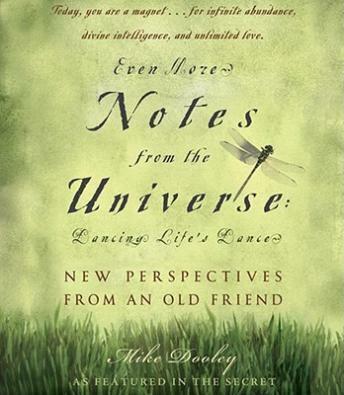 Mike Dooley serves as an interpreter for the Universe. Even More Notes from the Universe is the third installment in the three-volume set that is brimming with powerful affirmations that will have listeners thinking positively, feeling confident, and walking the path to personal success. When listeners discover the truths the Universe is unveiling in Even More Notes from the Universe, they will begin living happier, more fulfilling lives.